So no single value is correct to return from 0/0 or 00 in all circumstances. Some languages with multiple numeric types specify different results for zeros of different types. Constraining the behavior by numeric type is an opaque, and hence undesirable, practice. A path which has apparently not been explored is making limit a function provided by the language. for every ε > 0 there exists a δ > 0 such that for all real numbers x with 0 < |x-p| < δ, we have |f(x)-L| < ε.
for every R < 0 there exists a δ > 0 such that for all real numbers x with 0 < |x-p| < δ, we have f(x) < R.
If, in the definitions, x-p is used instead of |x-p|, then we get a right-handed limit, denoted by limx→p+. If p-x is used, we get a left-handed limit, denoted by limx→p-. These definitions are routine for analysis, with a heavy dependence on the Axiom of Choice. From a functional point of view the limit is an extrapolation of a function to a point possibly outside that function's range. From a computational point of view the first definition only allows us to check whether a given L is the limit of f(x). Because the limit doesn't always exist, we would also like our procedure to test whether the limit exists. To do this, f(x) would be evaluated at several points successively nearer to p; and the algorithm would check that the sequence of | f(x) - L | values are monotonically decreasing. The range of arguments to the function f should be controlled by an input to the algorithm. The function f should be called with values of x which are successively closer to p.
As soon as the behavior of f(x) indicates that its limit doesn't exist, the algorithm should exit without further calls to f.
The function f should not be called with argument p.
One might think that the space between successive values of f(x) would decrease with x closing on p when the x are evenly spaced. But that is not necessarily the case. The square-root of 0 is 0; and that right-hand limit exists, but the square-roots near 0 are further apart than the square-roots near 1, as Figure 1 shows. 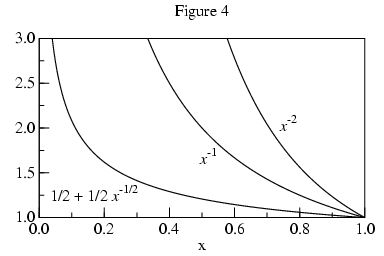 In fact, the slope (1/2 x-1/2) tends to infinity as x tends to 0. 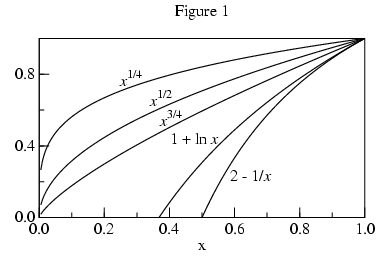 Figure 1 also shows 1+ln(x) and 2-(1/x), functions whose limits at 0 tend to negative infinity. So how will the algorithm distinguish between vertical points-of-inflection and infinite limits? We will return to this question. The central problem is how to find a value very close to f(p) without actually calling f(p). With two values of f we can construct the secant (a straight line connecting two points on a curve) and find its intersection with x=p. 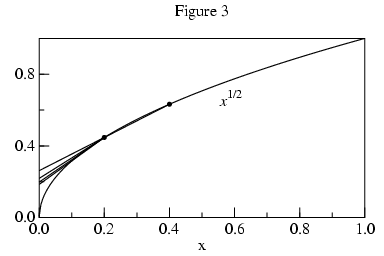 Using this extrapolated value will be more accurate than the value of f at the sample nearest to p.
This polynomial extrapolation will be accurate for curves with finite slopes at the limit point p. As the tangents of figure 3 show, this extrapolation is less satisfactory when the slope at the limit point tends to infinity. Fitting a polynomial to the inverse of f would give a better estimate of f(p); in the case of roots of polynomial equations, it would yield exact results. The monotonicity conditions developed later will guarantee that the inverse function is single valued. For n=3, things get more complicated. The value of f0(=L) which makes the equation true can be determined by a root-finder; or by solving this degree 2 polynomial in f0 using the quadratic formula. As the degree is increased, expression size grows exponentially; quickly becoming unwieldy. Until a more tractable form is found, the algorithm will extrapolate from a quadratic fitted to 3 points of f -1 when the slope tends to infinity near p.
Unfortunately, our approximation is strongly influenced by the closest f(x) sample. Using the approximation value for L in the convergence test prevents the algorithm from exiting early when the limit doesn't exist. Although |f(x)-L| is not available, derivatives of f(x) are. Secants are proportional to the derivative of f(x). By the Mean value theorem, there is a point between the secant endpoints such that the derivative of f at that point equals the slope of the secant. Approaching p, monotonic curves whose limit points tend to infinity are as steep or steeper than logarithms (hyperbolic, for example). Thus the algorithm should look for |f'(x)| increasing proportionally faster than |1/(x-p)| as x tends toward p. If that is the case, then the limit is infinite. If |f'(x)| is monotonic and increases more slowly than |1/(x-p)| as x tends toward p, then L is extrapolated and returned. , has an envelope increasing proportionally faster than |1/x| as x tends toward 0. 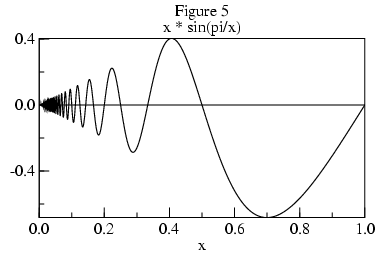 Figure 5 shows a curve of x sin(pi/x), whose limit at 0 is 0. 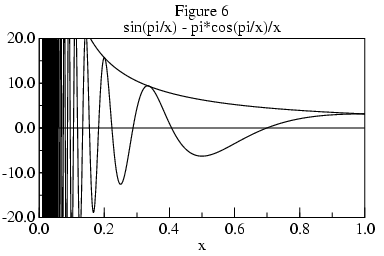 Figure 6 shows its derivative, whose envelope is pi/x. Not absolutely convergent, this series meets the Cauchy criterion for conditional convergence. 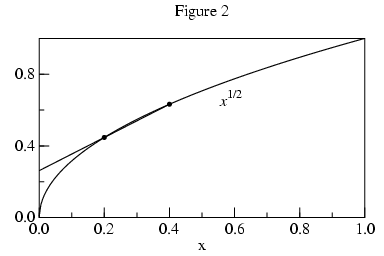 While it may be possible to determine whether a limit exists from the envelope of such curves, because the magnitude of the derivative tends to infinity as x nears 0, its values are of no use in extrapolating the limit L. Apart from needing to formalize the concept of envelope, non-monotonic curves present practical problems for algorithms which will examine f at only a small number of points. If the algorithm is unlucky in its choice of points, then it will incorrectly gage the envelope. For these reasons, the algorithm is restricted to monotonic functions. f is a real function of one variable whose derivative is monotonic or constant over the interval p+r to p+r/n. The function f should be continuously differentiable over the interval p+r to p+r/n. It will be called up to n times with an argument in that interval. For integer j, 0 < j < n+1, let xj = p+(r j/n). For 1 < j < n+1, let sj = f(xj) - f(xj-1). For 1 < j < n, let hj = hn n/j. (xj , f(xj )) for 0 < j < n+1. If for 1 < j < n, |sj| > |sj+1| and |sj| >= hj, then the limit tends to infinity of sign s2. Otherwise, the limit does not exist at scale r.
Suppose f(x) is a real-valued function. We can also consider the limit of function f when x increases or decreases indefinitely. for every R > 0 there exists S >0 such that for all real numbers x>S, we have f(x)>R. For the point limits we evaluated f at a succession of evenly spaced points leading to the limit point p. Uniform spacing doesn't lead to an infinite limit point. Instead, we transform the problem by taking a point limit of g(x)=f(1/x) at 0 from 1/r. The limit procedure has been coded in Scheme as part of the SLIB Scheme Library.